"By seventh grade, I was committed to mathematics." Not all students, however, love math like Rosalyn Yalow, a 1977 Nobel Prize winner, did. English Language Learners in particular often have difficulty in their math classes. Their lower levels of language proficiency can make it hard for them to be successful when have to solve word problems and then explain aloud or in writing how they got their answers. As well, some teachers dislike teaching math because they do not have a solid grounding in the subject. 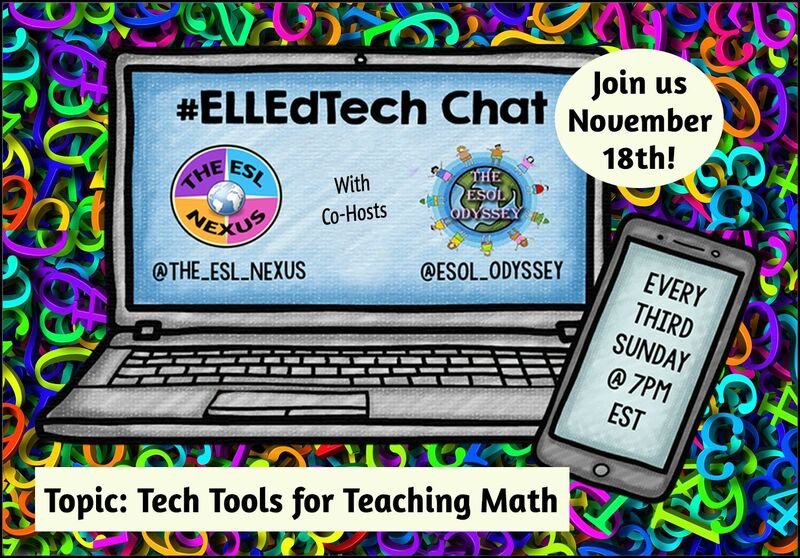 To help teachers help their ELLs learn math, the next #ELLEdTech chat will focus on Tech Tools for Teaching Math. Please join Laurah, my co-host from Tools for Teachers by Laurah J, and me on Sunday, November 18th, to discuss this topic. As always, the chat will start at 4:00pm Pacific, 7:00pm Eastern, and 11:00pm UTC time. Below are the details. You are welcome to let your teacher friends who might be interested in joining us know about this Twitter chat. And for more info about teaching Math to ELLs, you might like to follow my Pinterest board Math for ELLs, which posts resources, articles and ideas about this subject.